Last night we joined two other home school families for an evening at the Hollywood Bowl. The bowl offers a huge variety of musical performances throughout the season. 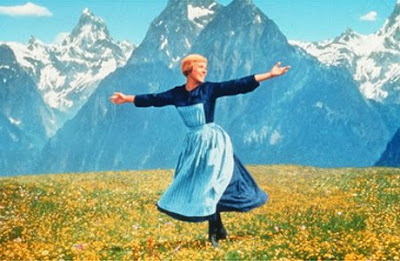 Having no idea what to expect, we thought we'd try "The Sound of Music" sing-a-long. Three tips: one, bring something for a picnic before the show. We spread out a blanket in one of the grassy areas outside the bowl and enjoyed our "Subway" sandwiches, picked up along the way. Two, if at all possible, try and avoid the "stacked" parking lots next to the Bowl. They're not cheap, and you can't leave until the show is over. I always prefer parking far away and literally walking in. Three, bring a sweater or jacket, and a blanket. Even on a very warm September day, it got surprisingly cool into the evening. "The Sound of Music" sing-a-long is just that: you watch the movie with 18,000 of your closest friends and sing along to the music. Think a G rated (or PG) version of the Rocky Horror Picture Show. We read that there was a "costume parade" before hand. We had no idea what this would be, but my son wanted to participate at the last minute, using what we had at home. In that we didn't have any lederhosen or other Austrian costumes laying around, he went as a goat herder. You know, from the marionette scene. His costume looked more like a shepherd, maybe from a millennium or two earlier. It was less of a parade, more of a costume contest. My son was in the very front of the line, which was fun. Each participant (there were at least 200) individually went on stage, said their name, and who they were. The host asked my son "and who are you?" He said "I'm the shepherd boy" - she responded, "that's perfect, you can be in the movie and in the nativity scene ..." 60 years from now he'll be able to tell his grandkids "Hollywood Bowl? No big deal, I was on stage there back in the day." Some of the costumes were pretty amazing: a group behind us came as the "boat scene" (from the movie). Others were even more creative: one couple were dressed in huge numbers "16 going on 17". The group that won the contest (they actually had prizes) dressed up as musical notes: "do, re, mi, fa, so ...." The costume contest went for a whole hour. The movie finally started when it got dark around 7:30pm. We opted for the "cheap seats" (or "cheaper seats") near the top. The sound was great, but the screen was small. It was a unique experience watching a movie with 18,000 other people. The crowd was rowdier than I expected - there's a lot of alcohol consumed at the Hollywood Bowl, even on evenings that attract a lot of families. In additional to singing along to every song, the crowd booed the Nazis, hissed at the Baroness, cheered along with Maria and the children, laughed at anything that was remotely funny, and waved their illuminated cell phones during "Edelweiss." I don't want to be a grouch - but I was pretty annoyed with the handful of people who brought in red laser pointers (designed for highlighting a power point demonstration) to "boo" the bad guys during the film (the Baroness, the Nazis and Nazi sympathizers). It was fun to go once, but if you're looking for a traditional Hollywood Bowl concert experience, "The Sound of Music" sing-a-long is probably not for you. "The Sound of Music" was released in 1965 (and based on the 1959 Broadway musical) and won 5 Academy Awards, including Best Picture. It remains one of the most popular films of all times. While not what I would call a "Christian film" in the strictest sense, it contains strong themes of good and evil, faith, love, courage, family. I'm reminded of St. Paul's admonition to "hate what is evil, cling to what is good" (Romans 12:9). Watching the film in the Hollywood Bowl, with a clear view of the Hollywood sign behind it, I couldn't help but wonder when the next time a G (or PG) rated film will win an Academy Award for Best Picture. My hope is sooner rather than later. Here's a link to the Hollywood Bowl website.